After being completely outplayed at Hamilton, Bhuvneshwar Kumar on Thursday said that the embarrassing loss was a reality check for them. India were dismissed for 92 in 30.5 overs after which the Kiwis rollicked towards victory. “If you look at the cricket we have been playing in the last few months, we have played good cricket and such matches come after some time. So it is a kind of reality check what we can do and improve in the next matches,” Bhuvneshwar said. “We were confident after winning the series but things didn’t go our way. I don’t want to take credit away from these guys. They bowled really well and outplayed us,” Bhuvneshwar added. 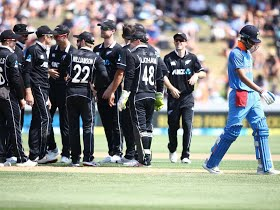 The match saw Trent Boult (5-21) and Colin de Grandhomme (3-26) completely running riot with Indian batsmen. However, Bhuvneshwar did not believe Kiwis exposed Indian batting. “Not really, we have played in England, South Africa and Australia, and we have done really well. I would say they bowled really well, bowled some amazing and unplayable balls and yes overall, they outplayed us,” Kumar went on to say. After the 5th ODI, India will feature in three T20s against New Zealand.